Digital audio networking is an established technology for connecting professional audio equipment using standard networking technology. The technology has been around for nearly 20 years and has been used on tens of thousands of projects worldwide. There are a number of audio networking protocols that manufacturers can adopt into their products. However, whilst audio networking is an incredibly beneficial technology, the vast majority of audio networks don’t use the building’s corporate IT network. With the overall transition away from analogue audio, its becoming increasingly common for the cat-5 or fibre for the audio system to be installed separately or for the audio system to use shared dark fibres, alongside the ones used for all other IT systems. However, the lack of integration with the corporate IT network is holding back adoption of audio networking. Why is networked audio not integrated? It’s a good question, you would think that any IP based technology can co-exist on a network but its not always as easy as that. Putting audio across an IP network can be a difficult thing to do. Some audio networking protocols have been made easy so that sound engineers can use them, but then they lack the power and flexibility to work in a mixed IT network. They may offer plug and play but you have little ability to control the behavior of the audio networking protocol to match the capabilities of the corporate network. RAVENNA is the only audio networking protocol that provides seamless co-existence with other network traffic. Built from its pedigree of being used for critical broadcast events, RAVENNA has a number of specific advantages over all other networked audio protocols. If you have a large corporate IT network, RAVENNA audio can operate seamlessly in that environment giving first class reliable audio for any size project. 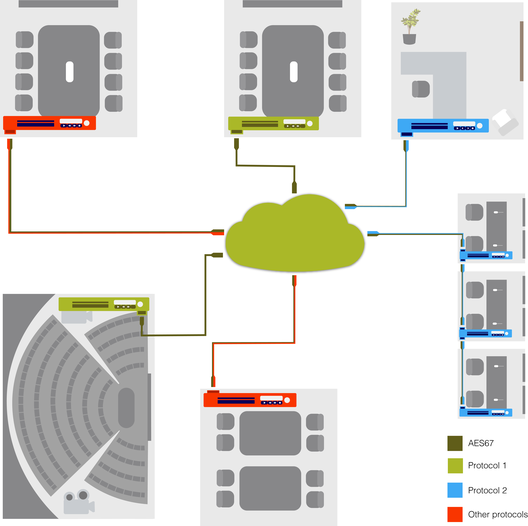 RAVENNA is a professional audio networking protocol that was originally designed for complex broadcast requirements. In a typical broadcast complex we route hundreds of channels of audio to and from dozens or even hundreds of locations. Live broadcasts don’t tolerate failure so they demanded a protocol that would be robust. This routing can even take place across a broadcaster’s WAN. These networking capabilities had to be able to sit along-side the many other IT requirements and so it had to be flexible in order to cope with other traffic needs that might conflict with it. After several years of delivering networked audio we found that corporate IT networks have near identical audio challenges to those of broadcast. Modern office buildings are very similar to broadcast complexes. They have many rooms and areas with their own audio requirements that ideally would sit on the overall building IT infrastructure. Unfortunately in offices the audio is often separate, either kept analogue or it uses a separate network because other audio networking technologies cannot be made to operate within a building IT network. RAVENNA is powerful and adaptable. Whilst it is sometimes more difficult to set up for the average audio engineer, it offers the real flexibility that IT professionals need. RAVENNA will work seamlessly in a large corporate IT environment alongside your other services, providing the IT manager control over your all your systems, including, for the first time, audio. Notes for IT managers - Why IP-based Networking? 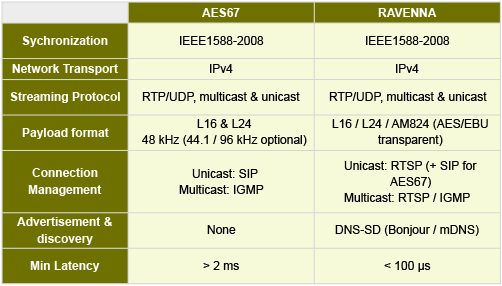 AES67 allows individual items to be connected to a network that primarily uses one protocol. AES67 could even allow a system to be made up of items all using different protocols. ALC NetworX and many other RAVENNA partners are members of the Media Networking Alliance, promoting the adoption of AES67. 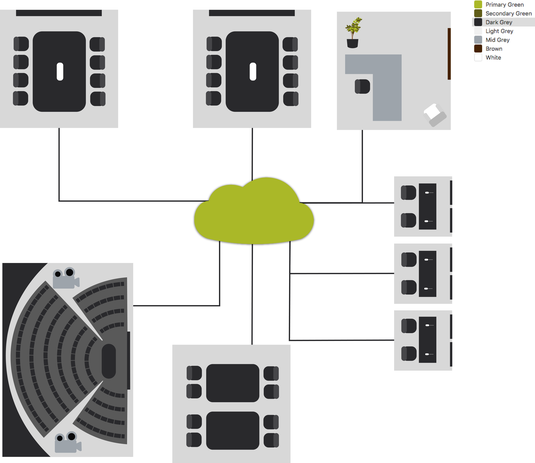 RAVENNA allows professional audio networking to work on large corporate networks.